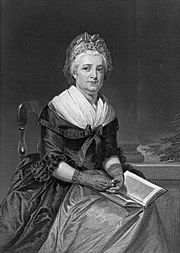 Martha Dandridge Custis Washington was the wife of George Washington, the first president of the United States, and therefore is seen as the first First Lady of the United States although that title was not coined until after her death; she was simply known as "Lady Washington." George Washington took his oath of office in New York City on April 30, 1789, and assumed the new duties of President of the United States; his wife brought to their position a tact and discretion developed over 58 years of life in Tidewater Virginia society. Martha ("Patsy") Dandridge was the eldest daughter of Virginia planter John Dandridge and Frances Jones. Martha was born near Williamsburg, Virginia. She enjoyed riding horses, gardening, sewing, playing the spinet and dancing. Her father saw that she received a fair education in basic mathematics, reading and writing; something girls primarily did not receive at the time. At the age of 18, she married Daniel Parke Custis, a rich bachelor two decades her senior. They had four children together. A son and a daughter, Daniel and Frances, died in childhood, but two older children, John (Jacky) Parke Custis and Martha ("Patsy") Parke Custis survived to young adulthood. Custis' death in 1757 left Martha a rich widow, with independent control over a dower inheritance for her lifetime and trustee control over the inheritance of her minor children. Martha was left with the duties of running the household, the estate and raising her children. Fatherless children were usually "raised" under the auspices of a guardian, even if the mother survived—which meant that another male, primarily a relative, took care of the estates of the children. Her early education proved quite helpful in the task. Her husband's former business manager stayed on to help with the operation of the plantation and she consulted with lawyers when she felt it was necessary. Two years after the death of her first husband, Martha Dandridge Custis married Colonel George Washington on January 6, 1759. Washington had been commander of the First Virginia Regiment in the French and Indian War and had been elected a burgess representing Frederick County in 1758. He had acquired Mount Vernon by lease from the widow of his half-brother Lawrence in 1754. He inherited the plantation upon her death in 1761. Before his marriage, Washington had increased the size of Mount Vernon from the original one-and-one-half-story dwelling to a two-and-one-half story home. George and Martha Washington and her children, Jacky and Patsy, moved to Mount Vernon in April, 1759. Mount Vernon remained George and Martha's home until their respective deaths, although they spent much time elsewhere during the war and presidential years. Martha's teenage daughter Patsy died at Mount Vernon. The following year, Martha's son John Parke Custis married Eleanor Calvert. George Washington attended the wedding, but Martha was so grief-stricken over Patsy's death, she was unable to make the trip. Jacky and Eleanor had five children. The political unrest in the colonies was becoming more apparent and voltile. The colonists were being burdened with an inordinant amount of taxes and levies. The Founding Fathers were friends and neighbors of George and Martha. Martha's friends and family were supporters on both sides, which made her feel at times alienated on both sides. George, however, felt it was his duty to assume some role of leadership at the urging of some of his fellow patriots. He began by working on recruiting and training an armed force. Militia were organized by state. Knowing he would have to be away from Martha, he asked Jacky and Eleanor to stay at Mount Vernon while he was gone. George Washington soon became the Commander-in-Chief of the Continental Army and he took charge of his army at Cambridge, Massachusetts in the winter of 1775. George's family and some friends traveled two weeks to be with him there for Christmas. The General was feeling ill and his wife stayed to nurse him. He sent her home from Long Island when the fighting got closer in June, 1776. She wouldn't see him again until March of 1778, where the army was encamped at Valley Forge, for the winter. Jacky sat in the Virginia House of Delegates from 1778 until 1781. He served as a civilian aide-de-camp to Washington during the siege of Yorktown. He contracted camp fever after brief service as his stepfather's aide, and died in New Kent County not long after Cornwallis's surrender. He was buried in York County, near Williamsburg. He was the last of Martha's children and she was very distraught over the loss. George told her to stay at Mount Vernon instead of being with him that winter. Eleanor became sick and left two of her children (Nelly and Wash) in Martha's care. The war ended on November 25, 1783, when the British left their last stronghold. Washington said farewell to his troops at Fraunces Tavern in New York, shopped for gifts for his grandchildren in Philadelphia and resigned his commission in Annapolis then the temporary home of Congress. On Christmas Eve, he rode into Mount Vernon. Eleanor soon remarried a widower, Dr. Stuart, who had set up practice in Alexandria. Due to some confusion in guardianship and Martha's own distress at losing her grandchildren, Nelly and Washington ended up staying at Mount Vernon. The Constitutional Convention was convening and George traveled to take part. He was named president of the convention and before ratification of the new Constitution, he was being urged to accept the role of the President of the United States. He returned to Mount Vernon. Both he and Martha realized that he would be President by the beginning of 1789. In April, he was elected unanimously by the Electoral College. Martha opposed his election as president of the newly formed United States of America, and refused to attend the inauguration, but gracefully fulfilled her duties as the official state hostess during their two terms. At the President's House in temporary capitals, New York and Philadelphia, the Washingtons chose to entertain in formal style, deliberately emphasizing the new republic's wish to be accepted as the equal of the established governments of Europe. Still, Martha's warm hospitality made her guests feel welcome and put strangers at ease. She took little satisfaction in "formal compliments and empty ceremonies" and declared that "I am fond of only what comes from the heart." Abigail Adams, who sat at her right during parties and receptions, praised her as "one of those unassuming characters which create Love and Esteem." After riding the grounds of Mount Vernon one chilly December day, George returned home with a severe cold. He died from it effects on December 14, 1799. Martha was too overwhelmed to attend the funeral. Upon his death, she closed the door to their bed chamber and moved herself to a tiny, plain garret chamber on the third floor of the mansion, directly over Nelly's bedroom. Twenty days before her beloved grandfather's death, Nelly gave birth to her first child, Frances Parke Lewis. The baby was a joy to Martha, and lessened the pain, somewhat, of her grief. The will of George Washington ordered the freedom of half of his slaves, leaving the old and the very young to remain. Martha freed them all on January 1, 1801. Her own health was deteriorating and in March of 1802, sensing her death, she made a will. She then burned all her letters she and her husband had written to one another over the years. Only two or three survived. Martha Dandridge Custis Washington breathed her last breath May 22, 1802, with her beloved granddaughter Nelly nearby. She was entombed next to her husband at Mount Vernon. Some of the estate left by Daniel Parke Custis to his descendants was eventually confiscated from George Washington Parke Custis's son-in-law, Robert E. Lee during the Civil War. The property later became Arlington National Cemetery. In 1882, after many years in the lower courts, the matter of the ownership of Arlington National Cemetery was brought before the United States Supreme Court. The Court affirmed a Circuit Court decision that the property in question rightfully belonged to the Lee family. The United States Congress then appropriated the sum of $150,000 for the purchase of the property from the Lee Family. Brady, Patricia. Martha Washington: An American Life. New York: Viking/Penquin Group, 2005. ISBN 0670034304. Wiencek, Henry. An Imperfect God: George Washington, His Slaves, and the Creation of America. New York: Farrar, Straus and Giroux, 2003. ISBN 0374529515. History of "Martha Dandridge Washington"
This page was last modified on 24 August 2018, at 15:02.